American civil religion is a term given to a shared set of certain fundamental beliefs, values, holidays, and rituals by those who live in the United States of America. These shared values and holidays are based upon, parallel to, but independent of the theological tenets of each specific denomination or religious belief. The notion of a civil religion originated in the United States due to its origins as a religiously diverse nation. From the Pilgrim founders and the other Puritan groups to the numerous other groups fleeing religious persecution, the American nation had a unique experience and developed a system that allowed for maximum freedom of religion for individuals and groups while allowing no one religious denomination to dominate. In this context, the nation developed a religious, primarily Protestant ethos and set of values based on religion but not overtly based on any one tradition. The term was coined by sociologist Robert Bellah in 1967. The article in which the term is coined, "Civil Religion in America," sparked one of the most controversial debates in United States sociology. Soon after the paper was published, the topic became the major focus at religious sociology conferences and numerous articles and books were written on the subject. The debate reached it peak with the American Bicentennial celebration in 1976. The American civil religion emerged as a means to permit the creation of a distinct national set of values that was not tied to a specific confession. It permitted religion to play a fundamental role in shaping the moral vision of the country but in a way that removed theological concerns from the public arena. The United States was settled in part by religious dissenters from the established Church of England, who desired a civil society founded on a different religious vision. Consequently, there has never been a state church in the United States and individual state churches have not existed in the United States since the early nineteenth century. Religious denominations compete with one another for allegiance in the public square. These facts have created a public discourse which accepts regular displays of religious piety by political leaders but in a vocabulary which captures the common values embraced by diverse religious traditions but eschews the particular theological tenets. 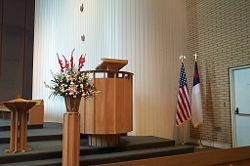 Unlike countries with established state churches, where the specific religious basis of political discourse is held in common and therefore taken for granted, American civil society developed a way of discussing the intersection of religious and political values in non-theological terms. Once in each of the last three centuries America has faced a time of trial, a time of testing so severe that … the existence of our nation has been called in question … the spiritual glue that had bound the nation together in previous years had simply collapsed. The founding of the nation is the first period. The Civil War and the 1960s were the other two periods. Bellah's ideas about civil religion were not novel. Before Bellah wrote his paper in 1967 coining the term "American civil religion" several prominent scholars had alluded to the concept. But there was no common conceptual term to describe, interpret or analyze civic religious faith in America. Religion in American takes no direct part in the government of society, but it must be regarded as the first of their political institutions; for if it does not impart a taste for freedom, it facilitates the use of it. Indeed, it is in this same point of view that the inhabitants of the United States themselves look upon religious belief. I do not know whether all Americans have a sincere faith in their religion for who can search the human heart?—but I am certain that they hold it to be indispensable to the maintenance of republican institutions. This opinion is not peculiar to a class of citizens or to a party, but it belongs to the whole nation and to every rank of society. Despotism may govern without faith, but liberty cannot. Religion is much more necessary in the republic … than in the monarchy … it is more needed in democratic republics than in any others. How is it possible that society should escape destruction if the moral tie is not strengthened in proportion as the political tie is relaxed? And what can be done with a people who are their own masters if they are not submissive to the Deity? Tocqueville saw in America the realization of the idea that inspired him. Scholarly progenitors of this idea include John Dewey who spoke of "common faith" (1934); Robin Williams's American Society: A Sociological Interpretation, (1951) which stated there was a "common religion" in America; Lloyd Warner's analysis of the Memorial Day celebrations in "Yankee City" (1953 ); Martin Marty's "religion in general" (1959); Will Herberg who spoke of "the American Way of Life" (1960, 1974); Sidney Mead's "religion of the Republic" (1963); and G. K. Chesterton advanced the thesis that the United States was "the only nation … founded on a creed" and also coined the phrase "a nation with a soul of a church." 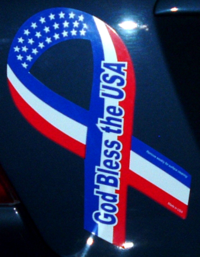 Today, according to social scientist Rondald Wimberley and William Swatos, there seems to be a firm consensus among social scientists that there is a part of Americanism that is especially religious in nature, which may be termed "civil religion." But this religious nature is less significant than the "transcendent universal religion of the nation" which late eighteenth century French intellectuals such as Jean-Jacques Rousseau and Alexis de Tocqueville wrote about. Bellah and fellow scholar Martin E. Marty studied civil religion as a cultural phenomenon, attempting to identify the actual tenets of civil religion in the United States of America, or to study civil religion as a phenomenon of cultural anthropology. Marty wrote that Americans approved of "religion in general" without being particularly concerned about the content of that faith, and attempted to distinguish "priestly" and "prophetic" roles within the practice of American civil religion, which he preferred to call the "public theology." Bellah wrote that civil religion was "an institutionalized collection of sacred beliefs about the American nation." He identified the American Revolution, the Civil War, and the Civil Rights Movement as three decisive historical events that impacted the content and imagery of civil religion in the United States. He also identified several modalities within U.S. civil religion related to the biblical categories of the priesthood, prophets, and wisdom tradition. Ronald Wimberley (1976) and other researchers collected large surveys and factor analytic studies which gave empirical support to Bellah's argument that civil religion is a distinct cultural phenomena within American society which is not embodied in American politics or denominational religion. Later research sought to determine who embraces views that could be characterized as part of the American civil religion. In a 1978 study by James Christenson and Ronald Wimberley, the researchers found that a wide cross section of American citizens have such beliefs. In general though, college graduates and political or religious liberals appear to be somewhat less likely to embrace civil religion. Protestants and Catholics have the same level of civil religiosity. Religions that were created in the United States, the Mormons, Adventists, and Pentecostals, have the highest civil religiosity. Jews, Unitarians and those with no religious preference have the lowest civil religion. Even though there is variation in the scores, the "great majority" of Americans are found to share the types of civil religious beliefs which Bellah identified. Further research found that civil religion plays a role in people's preferences for political candidates and policy positions. In 1980 Ronald Wimberley found that civil religious beliefs were more important than loyalties to a political party in predicting support for Nixon over McGovern with a sample of Sunday morning church goers who were surveyed near the election date and a general group of residents in the same community. In 1982 James Christenson and Ronald Wimberley found that civil religion was second only to occupation in predicting a person's political views. ↑ 1.0 1.1 1.2 Robert Neelly Bellah, "Civil Religion in America" Journal of the American Academy of Arts and Sciences 96 (1) (Winter 1967): 1–21 From the issue entitled "Religion in America". ↑ Dana Evan Kaplan. The Cambridge Companion to American Judaism. (Cambridge University Press, 2005. ISBN 0521822041), 118. ↑ 5.0 5.1 5.2 5.3 5.4 5.5 5.6 William H. Swatos. Encyclopedia of Religion and Society. (Rowman Altamira, 1998. ISBN 0761989560), 94. "The article caused an almost unprecedented burst of excitement among sociologists and other scholars of religion." Bellah, Robert Neelly, "Civil Religion in America." Journal of the American Academy of Arts and Sciences 96 (1) (Winter 1967): 1–21. From the issue entitled Religion in America. Canipe, Lee, "Under God and anti-communist: how the Pledge of Allegiance got religion in Cold-War America." Journal of Church and State March 22, 2002. . Cloud, Matthew W., "One nation, under God": tolerable acknowledgment of religion or unconstitutional cold war propaganda cloaked in American civil religion?" Journal of Church and State 46 (2)(March 22, 2004): 311 ISSN 0021-969X . Jewett, Robert, and John Shelton Lawrence. Captain America And The Crusade Against Evil: The Dilemma of Zealous Nationalism. Grand Rapids, MI: Wm. B. Eerdmans Publishing, ISBN 0802828590, specifically talks about American civil religion, referencing Jones's book, American Civil Religion. 328. Levinson, Sanford, 1979 "The Constitution" in American Civil Religion." The Supreme Court Review (1979): 123–151. Luckmann, Thomas. The Invisible Religion. 1967 Published the same year as Bellah's article. History of "American civil religion"
This page was last modified on 18 March 2019, at 15:25.